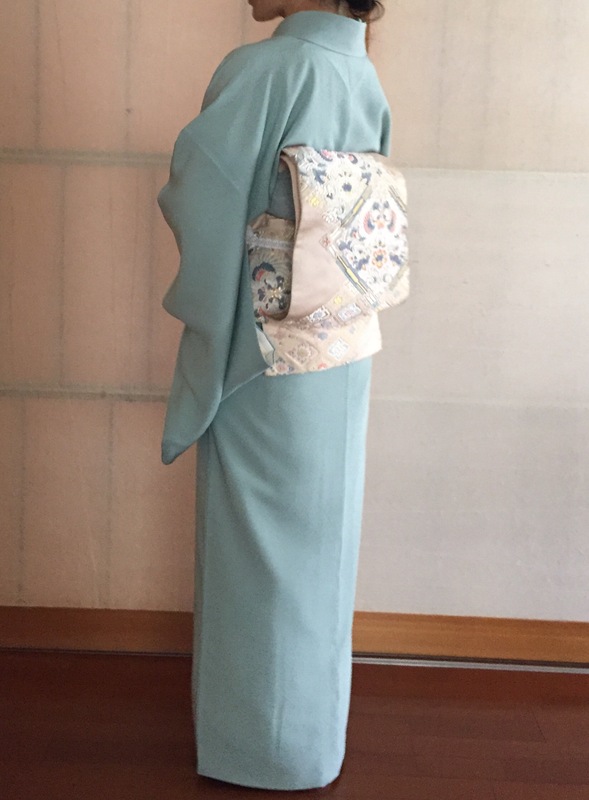 In Japan today, I regrettably admit that kimono is not worn on a daily basis any more. Kimono has become one of Japan’s cultural symbols and admired by many, but unfortunately it is not included in a part of our normal routine. Having said that, there are a few special occasions of the year when people do make an effort to put them on, and the beginning of April is one of them, for the entrance ceremony of their child/ren’s school. Our little one started her kindergarten this April, and there was, as expected, the entrance ceremony held for the adorable little new comers. In the morning of the ceremony, a bright sunny spring day, our daughter proudly put on her brand new uniform with the matching hat and backpack, and hit the road for the new phase of her life to commence. All of a sudden she looked so grown, making it hard for us to believe she was a tiny baby only a couple of years ago. It was a perfect excuse for me to wear my spring green kimono, with a gorgeous pastel phenix pattern obi handed down from my mum. The ceremony was to start at 10:00AM sharp, and based on my numerous practices with my kimono teacher, I timed it and decided to wake up at 6:30AM. The first thing to do is to put my make up on and my hair up before I start touching the valuable kimono (actually it’s a must, to do these preparations in advance, because we hardly ever “wash” this type of kimono/obi. It’s made of silk, and the contact with any liquid could ruin the fabric. If it gets dirty for whatever reason, we seek professional help, which of course comes with a bill). I was planning to leave our sleeping beauty in bed as long as possible in order to secure ample time to put kimono on, after grabbing a quick bite to eat for breakfast… But don’t things always turn out to be different from what you expected? As ironic as life is, only five minutes after I woke up I heard the click of our daughter’s bedroom door, only to find this cute little exciting face peeking out, already super active, and claiming determinedly, “Hungry!! !” So still in our pj’s and with my unwashed face and messy hair, we had breakfast, along with a grumpy sleepy Papa. OK, just a small change in the plan, I can still manage it, I thought. So I hurriedly finished eating and excused myself in the bathroom to fix up my face and hair, and finally was about to move onto dressing up in kimono. But don’t things always go wrong at the very best timing? By the time I was done with my makeup and hair, my husband locked himself up in the shower to beauty himself up for also his big day, while placing our girl in front of her favorite TV show (Peppa Pig). Still fine, OK, she can keep herself busy with Peppa and her friends, and I can focus on the long process of wearing the kimono… When our little one watches Peppa Pig, she can easily stay in front of the telly for an hour. Exactly the time I would like to have to put everything on carefully, starting from underwear (hadajuban), undergarment (nagajuban), kimono, and finally to obi belt. Around the time I started working on the kimono bit, only a few Peppa Pig episodes later, our curious munchkin skilfully turned the TV off with the large remote in her two little hands with clumsy fingers, came up to where I was, stating she wanted to offer some help. Oh dear……. a sense of panic ran through my head. I really need to concentrate on straightening all the creases, putting the length right, tightening the strings so that the kimono wouldn’t fall apart during the ceremony, and all the other complicated steps I have to follow to tie my obi. I don’t have time to pay attention to her right now, oh no oh no oh no (started sweating under my armpits by then)… I looked back to check the clock, and the time was ticking. I asked her nicely to leave me alone and go back to her Peppa, but no, she wanted to help Mama. Really? Today of all days? I once again checked the clock with the side of my eyes. Tick tack, tick tack, tick tack… I was beginning to get more and more agitated, and to my dismay, I finally raised my voice and told her to go away… go away… to my daughter, who was willing to offer me some help… The worst thing a mother could do… And her reaction was, rightfully, a HUGE tantrum. By the time this happened my husband came out of the shower smelling clean and fresh with a hint of his aftershave, steam coming up from his shoulders. Looking at him like that (he looked so satisfied and content), I couldn’t help but yell at him asking why he left her alone with me when I needed him to watch her the most. He said he was watching her while I was in the bathroom doing my face and hair (dah)… but sensing my urgency and devastation, he tried to calm me down and apologised for his shortcomings. Our little girl was still crying her head out, my husband looked at a loss not knowing what he could or should do in a situation like this. There was still half and hour left, and for a second I thought I could make it if I hurried up, but I decided to switch to Plan B – a plain but elegant dark blue dress (and it takes a minute to wear it). Looking at both of them like that, I finally realised how selfish I had been in that morning, focusing so much only on myself and kimono. I was so looking forward to wearing it on our little one’s special day, but at the same time I was almost ruining it. So right on time at 9:30AM, we left our apartment in our coincidentally matching outfits (blue shorts, blue dress, blue suits) and started walking to our girl’s new kindergarten. Despite her earlier tantrum she looked delighted and enthusiastic, and was enjoying every minute of the walk to her new school with her Papa and Mama. The sun was shining, the sky was clear and blue, and our neighbours and other pedestrians greeted us, everyone with a smile. Our daughter was beaming with pride in her new slightly oversized uniform. At the kindergarten, all the proud parents were taking pictures of their child, all dressed up nicely and moderately. No kimono in sight, which made me think it might have been a good thing that I wasn’t in kimono that day, because in Japan the conformity is greatly appreciated. Not that I don’t value individuality and uniqueness, but the ceremony was, after all, for the children, not for me. It was a perfect day, if you didn’t think about what had happened earlier that morning in our household. Kimono is beautiful. I have fallen in love with its glamour and gracefulness and am determined to learn more so that I can pass my knowledge to the next generation. However, I also learnt the downside of it, well I learnt it the hard way. Behind the scenes it requires a great deal of attention, time, effort, concentration and peace of mind. I failed on the latter two this time. You need to have a good balance of these elements; otherwise it would end up like what happened that day. After coming home from the charming ceremony, I attempted to put the kimono on once again while letting our daughter help me. This time, I was relaxed and focused, and finished the entire process within half an hour or so. Our daughter, also a mini kimono admirer, marvelled how beautiful I looked. And this time, I asked her to offer me one extra help. Our little big girl took pictures of me, standing up high on her big girl’s step. Photo by M. H. K.